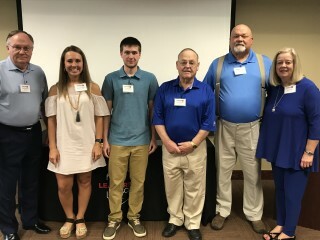 L to R: Blue Ridge Board Member Bradley McNeill, Caroline Current, Lucas Pruitt, Blue Ridge President Kenneth Greene, Blue Ridge Board Member David Boone, Ashe District Manager Kay Sexton. Blue Ridge Energy recently awarded $33,000 in college scholarships to 12 students across its service area seeking to further their academic goals. The scholarships are part of the Blue Ridge Energy Leadership Track program designed to help high school students better prepare for acceptance into the college of their dreams. The scholarships are renewable and total up to $4,000 each. Blue Ridge Energy Leadership Track students begin preparing for college in their freshman or sophomore year and develop leadership, interview and public speaking skills while preparing for the college acceptance process. As seniors, Leadership Track students are invited to apply for renewable scholarships worth up to $4,000 each. This year marks the 59th year Blue Ridge has awarded college scholarships. To date, 462 area students and citizens have received $478,000 to help them attend the college of their choice. For more information about the Blue Ridge Energy Leadership Track, visit our website, BlueRidgeEnergy.com, click on “Community” tab or contact Grey Scheer, director of community relations, at 759-8994 or gscheer@blueridgeenergy.com. Blue Ridge Energy is a member owned electric cooperative serving some 74,000 members in Caldwell, Watauga, Ashe, and Alleghany counties as well as parts of Wilkes, Avery, and Alexander counties. It also includes a propane heating fuels subsidiary and business-to-business telecommunications subsidiary.